Inspired by Patrick’s post about items he can no longer use because of ME/CFS, for our awareness day, I thought I’d share my own little list. Chimp helped me out enormously by taking most of the photos you’ll see here. Much of what Patrick shared was sports equipment. 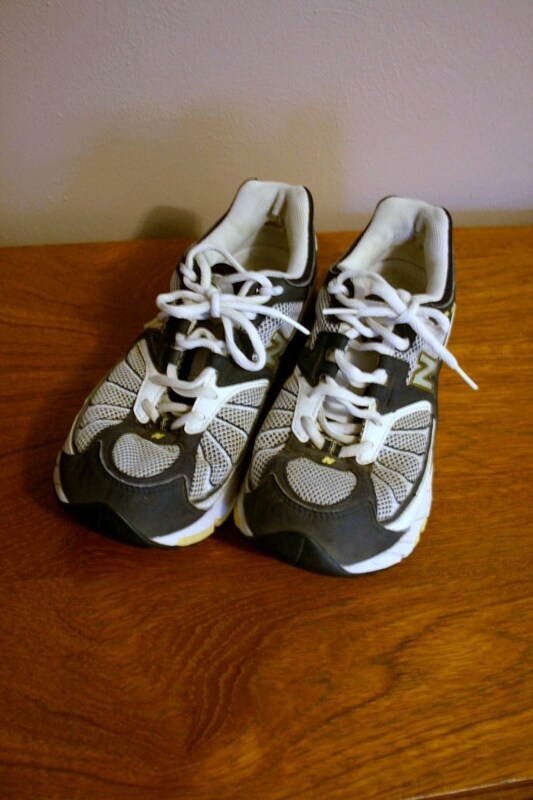 I’ve never owned a lot of that – I was not terribly athletic, but as I’ve previously mentioned, I did love to run. So the first item on this list is my last pair of running shoes, from 2003. I also owned a treadmill, which I bought in 2002 – it was ideal for running inside in the Michigan winter (or briefly, in the Fresno summer and/or pollution), but though we held onto it all the way to the move to Pennsylvania, I don’t have a photo of it. I especially wish I had a picture of me on it, as if that would prove that I do deserve the ability to be physically active. I also had a bike, a copper-colored Cannondale that was my first big adult purchase in 1996, at the height of the mountain bike fashion. Then I promptly had an accident on it during a long solo ride in another part of Virginia (skewed railroad tracks, the front wheel stuck, went flying, big scalp laceration below where my helmet protected me; it still itches on a regular basis). 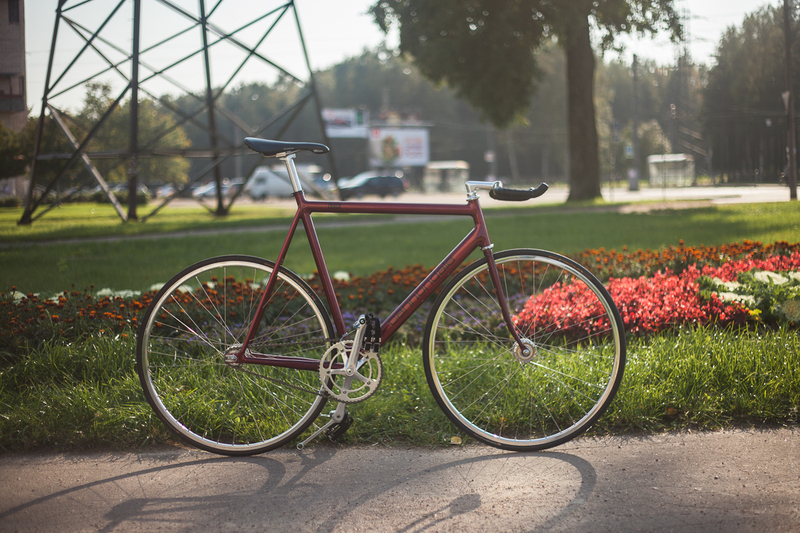 I had never used it as much as I wanted to – the accident left me pretty gun-shy, and once Chimp and I got together, I lived in places that were less bicycle-friendly than where I’d grown up riding. But in a fit of unreasonable optimism, I’d had the bike tuned up in 2007, hoping I would get well enough to coast around the neighborhood on it a little bit on a regular basis. Unfortunately, I didn’t, and then it was stolen (undoubtedly by tweakers) out of our garage in Fresno, so I don’t have a picture of it either. It was about the same color as the one pictured, though it had totally different components. My sewing machine was a very generous 2003 college graduation gift from my mother. 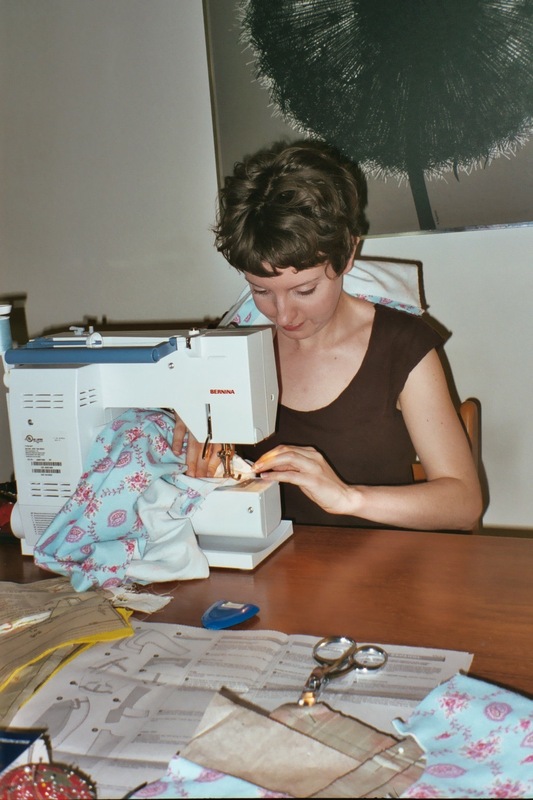 When I went back to school after we moved to Michigan, I decided to take a sewing course as an elective. Up until then, I’d never learned, despite my mom having grown up in 4-H and having made clothes and a number of elaborate costumes for my brother and me as kids. 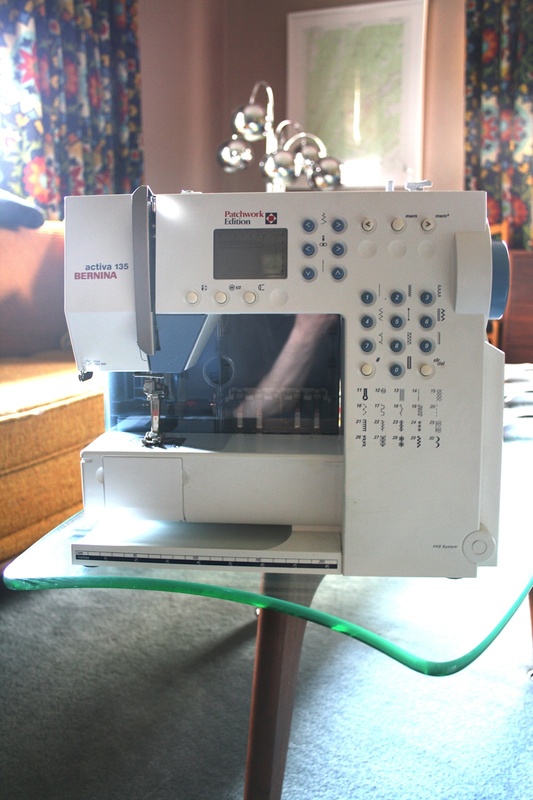 I got the same lovely model Bernina as we’d used in the class, and quickly added several handy feet, a big pack of bobbins, a subscription to BurdaStyle Magazine (patterns more interesting than the boring U.S. manufacturers) and started amassing a stash of patterns, fabric, and notions. 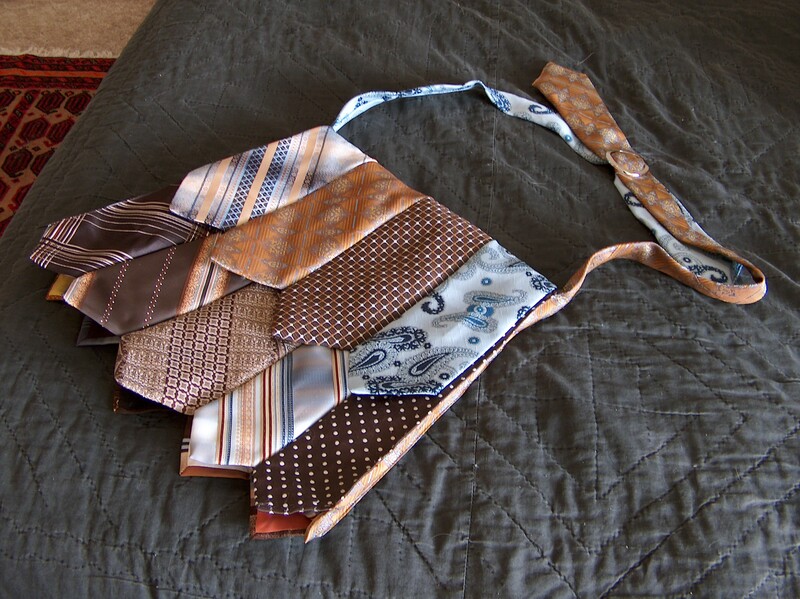 My favorite project I made with it was a messenger-style bag of my own design out of men’s ties. This is the second one I made, as a gift for a friend – the first one I made for myself didn’t have a flap. This has side gussets, a zipper, lining, interior pockets – everything. I was really proud of myself for figuring out from scratch the precise order that everything would need to go together. I got compliments on even the less-elaborate original wherever I went, and I still have a huge stash of vintage men’s ties I had been hoarding from my thrifting expeditions that I was planning to use to make more of them, possibly to sell. There have been plenty of tie purses on Etsy in the last ten years, not many as pretty as this, so I think it was a pretty solid idea! I do actually have a picture of myself using the machine, taken by my mom when she came to visit us in 2006. I’d previously made a nightgown for my mom and one for my mother-in-law, and there I’m working on a pair of pajamas for Chimp’s grandmother, which turned out to be my last project, and which I never finished. My mom hadn’t seen much of me since I’d been sick, and it was shocking to her to watch me need to stop sewing and lean my head on the machine because I was so tired. 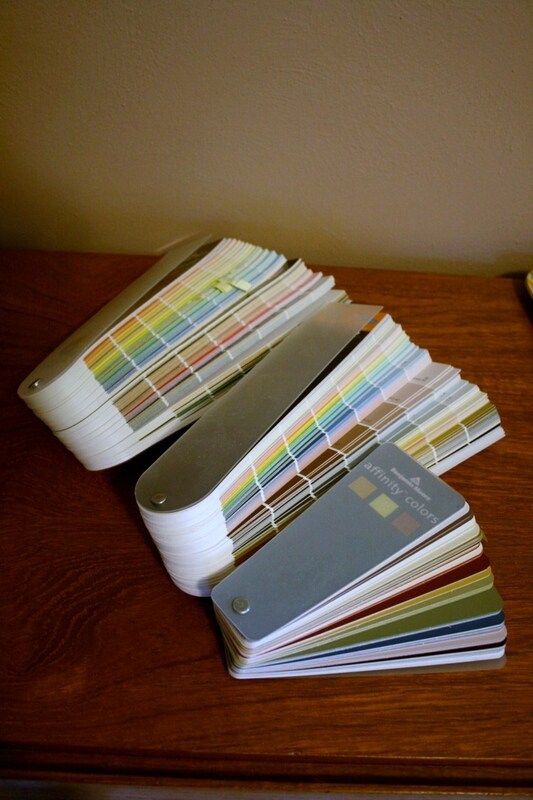 These Benjamin Moore fan decks are another item I can blame on a moment of unreasonable optimism. After I joined Chimp in Pennsylvania, I put these on my wish list, because the previous owners of our house appear to have chosen all their paint colors in the 80s. Pick a wall: if it’s not mauvy taupe it’s taupey mauve, or some blisteringly dull beige. 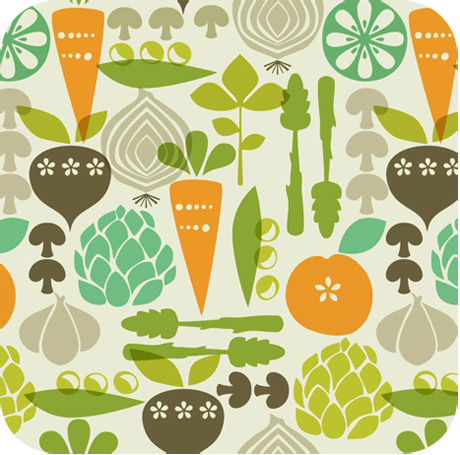 If I had my way, my room would be a pale spring green, my bathroom would be a light robin’s egg blue, the kitchen a cheery cantaloupe with white cabinets, slate countertops, and curtains of this retro fabric I have stashed away. Dr. Cheney thinks I’d need to be out of the house at least two weeks after painting; given the logistical nightmare that would be and my known intolerance of…everything, I despair of ever having the colors I want on the walls. Purses. Everybody needs a vice, right? Is it apparent I have a terrible weakness for the elaborately, riotously multicolored? 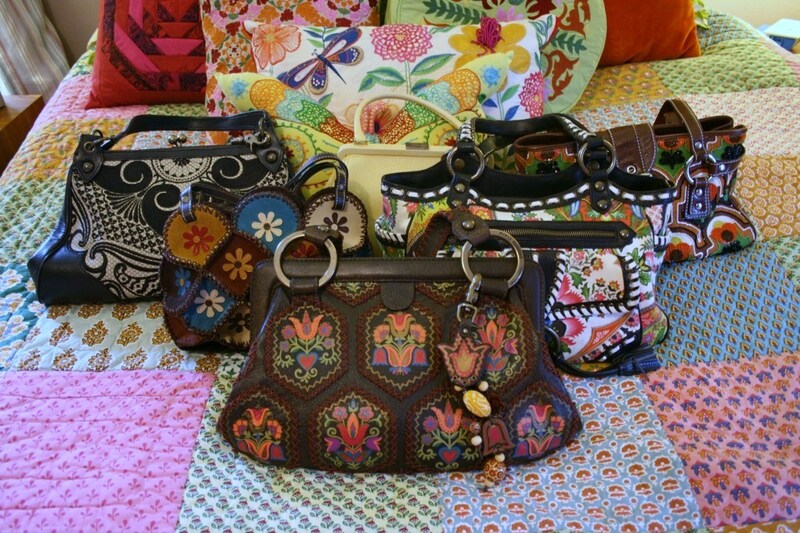 Five of those are Isabella Fiore bags I bought between 2003 and 2008, when they were turning out purses in their inimitable over-the-top style. They’ve gone through a couple of ownership changes and are mostly dreadfully boring by comparison now, and nobody has really taken their place in this wacky, gaudy, loud style niche. Maybe other people don’t want to pay hundreds of dollars to participate in bad taste. I can’t imagine why. At least it’s not a shoe problem. You put those on the ground. 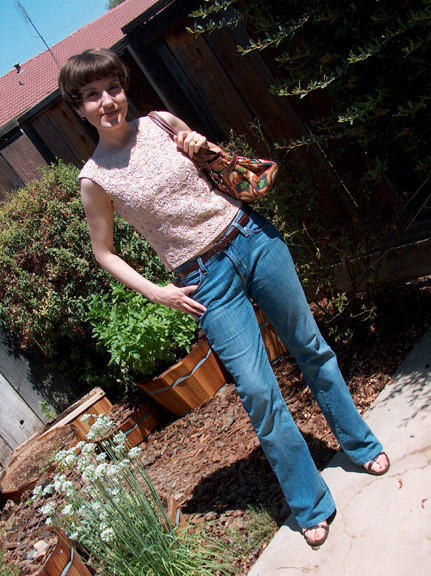 Here I am off to the farmer’s market wearing a 60s vintage top and carrying the bag at back right. My guitar (acoustic; my electric not pictured). Constant companion, calling card, and coping mechanism of the latter half of my teens! I was never what you’d call an accomplished player; I picked it up in high school because I hoped to one day be a counselor at my childhood summer camp (or as cool as the counselors at my childhood summer camp), and I got good enough to manage the easier half of the indigo girls catalogue. 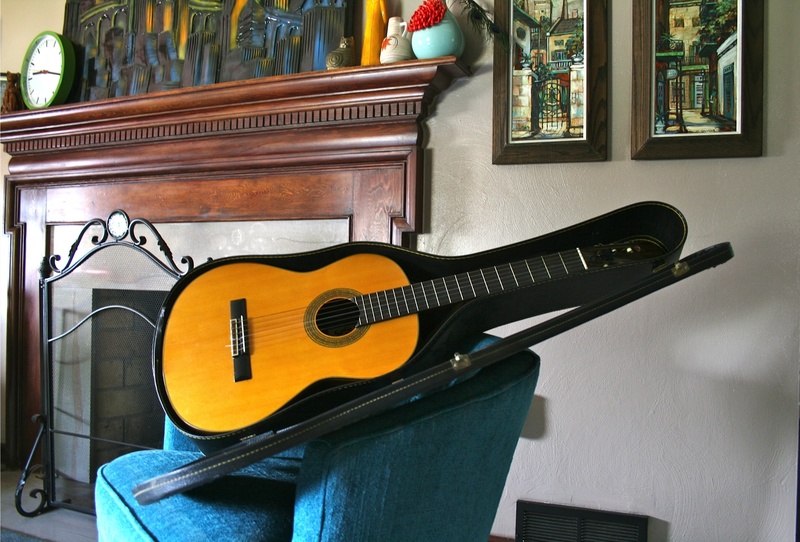 I didn’t end up on that summer camp staff – a loss of faith intervened, which is probably less of a problem at an Episcopal summer camp than I thought it was at the time – but the guitar I kept to noodle around on. I last played it on a regular basis during 1999 and 2000, when Chimp and I were in a nameless garage band in Virginia composed of a bunch of people with significant musical backgrounds…and me. Dress clothes. I have been a clotheshorse for a long time; when I was small, my mom wanted to buy me Carter’s, and I wanted Garanimals. When Chimp and I moved to California, that was the first point in our relationship where both of us had full-time incomes, and I was thrilled to be able to put more money into my Nanette Lepore and Anthropologie obsession. Here’s a slideshow of a few of my office outfits, which will give you a sense of my very definite aesthetic – I loved to mix vintage with new, and could never be accused of blending in. I suppose it’s a bit of a relief not to have to keep up with fashion with the no money I’m making now, but I’d rather be making money and doing so. CDs. Remember CDs? I lost my ability to listen to music on a regular basis when they were still a thing, so that’s why I have physical media to show, instead of just a picture of a hard drive. I think these are books of 200+, and all but one are stored double-sided, so 4oo+ discs per book. 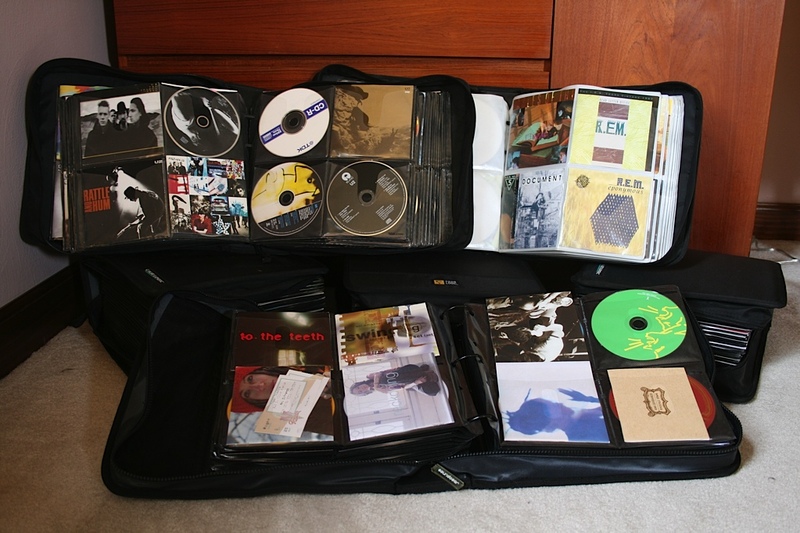 I bought a lot of music – like fashion, it was one of those things that I loved keeping up with, and I miss it immensely. It was good for my emotional health. 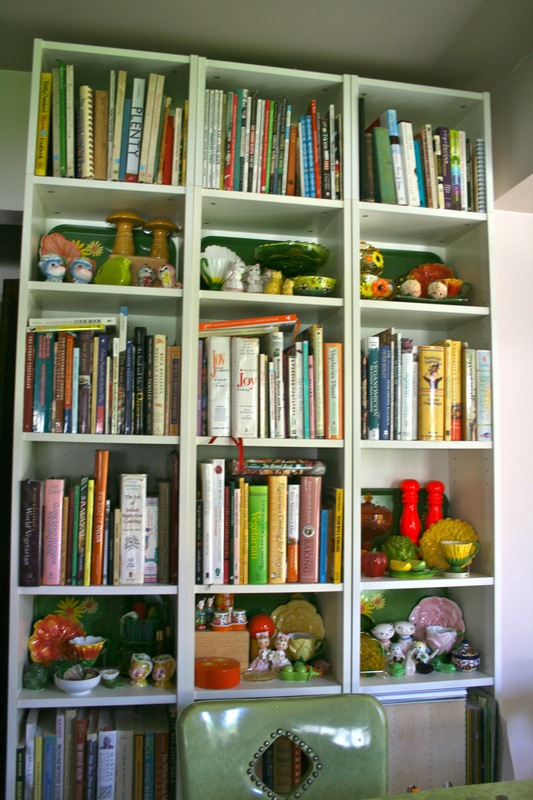 Cookbooks – and kitchen tchotchkes. I couldn’t get all the cookbooks in one photo (there are more below table level), but there are a couple hundred of them, about 75 of them specifically vegetarian. This does not include the books on other food subjects, my significant collection of which are on another bookshelf upstairs. I started picking these up in college, and the collection has mushroomed over the years (sorry). These were great as inspiration when I was writing my vegetarian food blog, titled She Spills the Beans. My idea of a great way to relax after work was to spend a couple hours cooking an elaborate seasonal dinner. Unfortunately, Chimp’s idea of The Most Stressful Thing Ever is to spend a couple hours cooking an elaborate seasonal dinner. I would show you pictures of the kitchen equipment itself, but you probably have some too and we would be here all week if I did. Here are the rest of the household’s books. 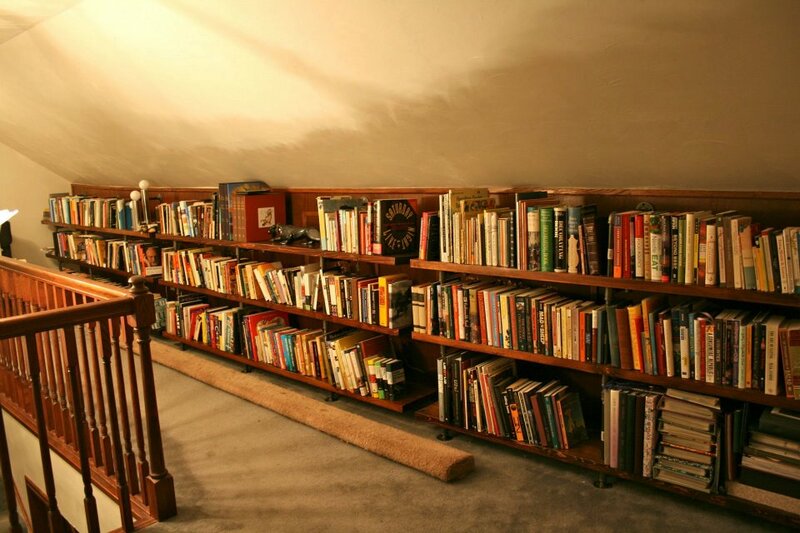 Chimp built those bookshelves out of 2x12s and gas pipe after I saw a set on The Brick House blog. This space under the roofline was otherwise pretty unusable, but now it looks beautiful. I can’t use physical books because it takes too much energy to hold one and turn pages. I have to restrict myself to texts I can read on the computer, where all that’s required of me is to press page down. And there are a lot more things than you might think not available as ebooks. It is a bummer. 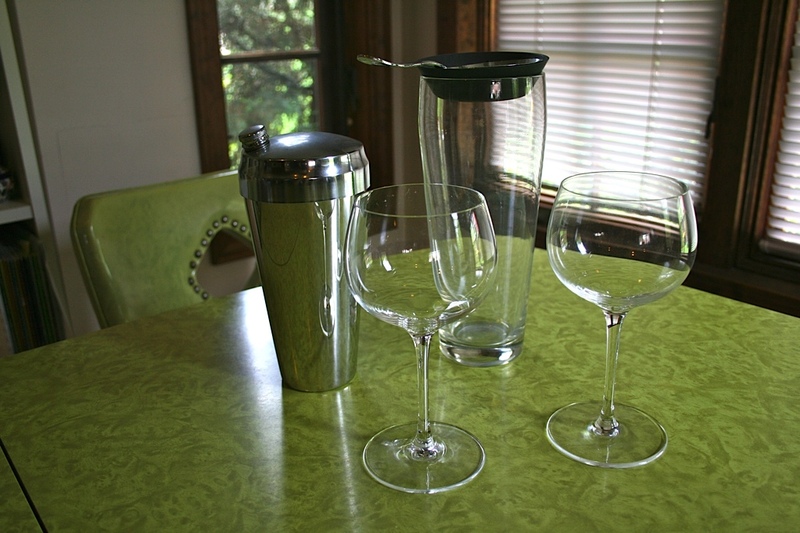 Booze paraphernalia. This is just a sample of it – because neither of us can drink anymore (it gives Chimp migraines) most of it is in storage, like our absolutely enormous collection of souvenir shot glasses that we, family, and friends have collected over the years. I didn’t lose my alcohol tolerance right away when I got sick, but a bit later on – it was gone by 2007. I miss my Maker’s Mark and ginger ale, and it’s a total drag that I’ve had to miss out on the rise of the craft cocktail movement. I had (until I passed them on to a friend going to bartending school) a pile of bartending guides, and I always thought that when I accumulated enough disposable income, I would set myself up with a serious liquor collection and learn to mix drinks as well as I cooked. So there you have it. 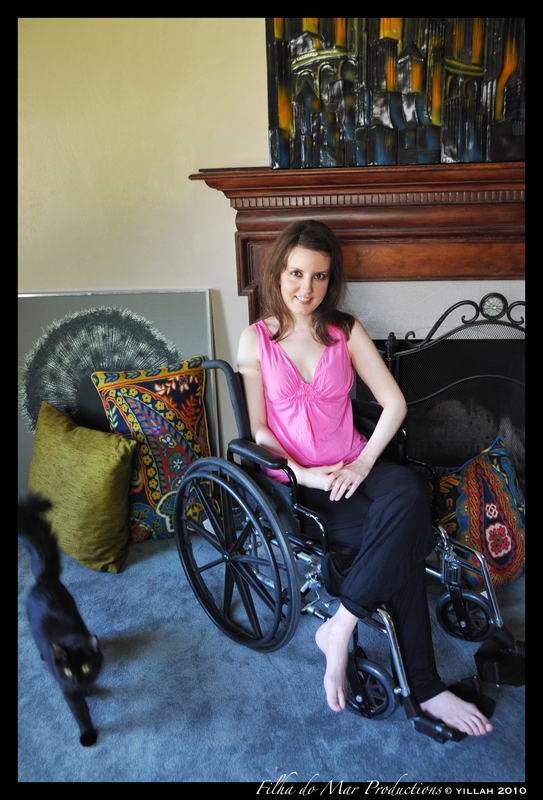 Another example of all the fun I don’t get to have because of ME/CFS. And the helpful thing about this stuff is that it’s always around the house to remind me. Oh, IE, I’m sorry, but I know just where you are. Our collective losses are overwhelming sometimes. I think that tie bag you made is beautiful. I got a bit teary reading that one. I too have a variety of things which I can’t let go of despite the fact that I can’t use them (I’m still holding onto that small hope that one day I will). Next would be my Karate gear. I managed to get to my brown belt (despite already having started to get sick, I went to a very inclusive dojo that was happy to make modifications so every one could join in) but eventually even the simple drills and exercises became more than I could handle. It took me months after stopping to accept that I needed to cancel my membership, about a year to sell my uniforms. I haven’t been able to give up the rest of my gear. Other things I have given up are activities, the main one being walking long distances. I am lucky enough to still be able to plod slowly around the block, or up and down the supermarket isles, but I used to do so much more. My family are big on walking (even my grandparents can walk way further and faster than me) and I used to be able to walk kilometres a day, just for fun. My favourite way to fill time on days off was to walk into town, then up and down the main street (sometimes back and forth three times because I had forgotten something at the other end of the street…my memory never was great). It’s hard to explain to people why beautiful sunny days sometimes make me want to cry, because they are perfect for walking, and I am so often stuck inside. Oh, cblondie, “It’s hard to explain to people why beautiful sunny days sometimes make me want to cry, because they are perfect for walking, and I am so often stuck inside.” *Everything* can remind us of activities we can’t do anymore, can’t it? I’m glad you’ve been able to keep well enough to keep working. That is wonderful. Fellow severe CFS/ME affectee and 12thMay Blog Bomber. At least these are things you *have* done, and used. That beats never haven risen above beige and bland at all, in my book. That was a year ago. 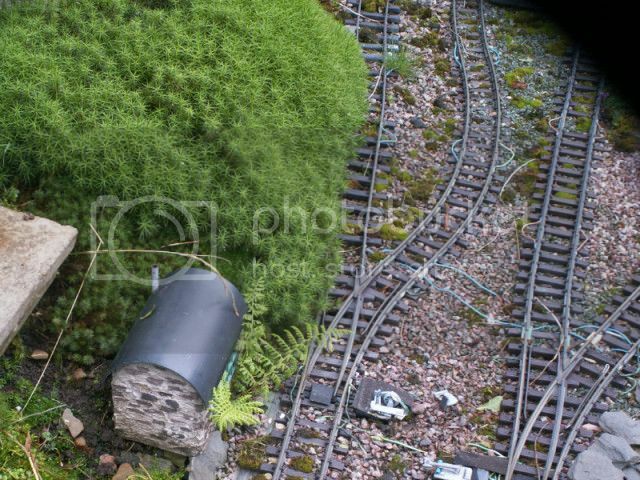 The garden has definitely reclaimed the outdoor model railway a bit more since then, and no trains have run, but I have not yet given up all hope, or plans. I had checked out your blog! I liked your post – it was very evocative of the multifarious struggle that is ME. You have excellent style!! Losing fashion and books are among my biggest heartbreaks also. Thanks, Emily! I feel a bit vain for caring about losing fashion, but it was part of how I expressed my creativity, and no longer having that channel is a loss. Wow, I relate to this so deeply. I even had my own ties-for-fabric collection!! And I’ve had the same problem with paint colors — it’s particularly cruel to be housebound or semi-housebound and unable to actually do things to change the look of your home. All day staring at those walls that make you crazy. Love the concept of this post; it’s a great way to really put into context how much talent and vitality is lost, not only to our own lives, but as contributions to the society around us. I read your blog with great interest and feel very sad for what you have had to give up. But I love those purses and can understand why you collected them. And I also love your clothes’ choices; great outfits. Beautiful taste. The purse you made of ties is very nice. I have lots of books and still read, but I read slowly these days and groan at very long tomes. I had a burst of energy in March about fixing up my apartment. I thought I could do a project a day (Ha!). No way. A project a week is more like it, and I have to be wary of ME/CFS flare-ups and symptoms. But I’ve done a few things and have lost my energy. And I want to paint my window frames, sills and radiators. I did this years ago. Now I worry about balance problems, and think I can’t do it, and if I did, would need a spotter and to do one a day at a time. And the cds! I relate. I have lots and I can’t listen to them, get headaches right away, especially if there are drums or xylophones involved. I occasionally listen to mellow jazz or old rhythm and blues and Motown cds, a bit at a time and very low. And I sympathize on the liquor issue: I can’t drink, lost tolerance early on in this disease when I drank a glass of champagne at a friend’s and put my head on the table. That was it. Yes, so many losses, including of outlets for creativity; that is very sad. It is very hard to be reminded of what life was and could be. It’s extraordinary how many possessions we have that we no longer use. But I still like collecting them. I buy clothes that I have no opportunity to wear, books that I probably won’t read. All my shoes are pristine! Oddly, I have become more obsessed with material things in a way, than pre-illness. – I notice more about them, as if they take on a life of their own… Probably being mostly house-bound and surrounded by things does it…. I just found your blog – are you still writing ? I am reaching out to ask if you are or have tried LDN? I haven’t had time to read your entire blog as I myself suffer many autoimmune ailments and it is too taxing for me. I wanted to suggest LDN – my doc just prescribed it for me so I am hoping this is my magic. Like you I have done so much for my Heath – and have spent so much money. I also have major Histmaine issues and have used many things to try and overcome this. To no avail. I sat for nine months staring at my LDN prescription – because I wanted to do it all naturally – homeopathic – supplements – TCM – you name it I’ve done it. I am hoping the LDN will also help a few other spider webs I’m fighting. Hello, Tanya! I’m still writing, but much less often. I have been on LDN for a number of years. I think it helps me with pain and sleep. Hope it helps you as well. Thank you for writing me back – did the LDN initially cause you insomnia ? Just wondering if it is just a transitional symptom that may go away. Also did you have histamine issues ? And if so did LDN help with this? I am only two nights taking it and both nights I haven’t slept. I also have heavy brain fog and feel a bit off – but maybe these are normal transitional symptoms – do you know if they are ? Any thoughts are greatly appreciated. It’s not caused me insomnia, but I have heard from other folks that it’s done so for them. Some say it passes, some move it to taking it first thing when they wake up. I haven’t heard of brain fog, but I have so much I don’t know if I’d notice a little more! I started at .5 mg and gradually worked up to 1.5 mg. I’ve heard of folks starting at .25 because .5 was too much to begin with.